POKHARA, Jan 1: Temple Tree resort is gleaming with domestic tourists as full-fledged winter festivities kick on in Pokhara. Of its 68 rooms around 25 percent of the rooms are occupied by domestic tourists. Similar is the trend in Shangri-La resort, around 30 percent of its 69 available rooms are servicing the domestic tourists. Domestic tourists are scattered across different denomination of hotels and businesses across the spectrum are deeply relieved. As offseason approaches – typically from December to March – the domestic tourists are conveniently lending a helping hand. This has made many businesses which, rely on domestic tourists when the frequency of foreigners drop optimistic. Businesses say that people who come for a short-term stay in the city typically spend a higher amount of money which has helped domestic tourists get recognition in the foreign-dominated playing field. “The domestic tourists spend on par with the foreign ones, which has helped in expanding opportunities in the market,” says a bright looking Bharat Raj Sharma, a tour operator. “The cheaper hotels were financially secure during the offseason, but the recent trend shows that the higher-end hotel also has been bolstered by high spending domestic tourist during this time of the year,” Sharma further adds. The annual Pokhara street festival has helped heat up the tourism sector in this season by attracting domestic tourists as winter cools down the frequency of foreign tourists in the region. 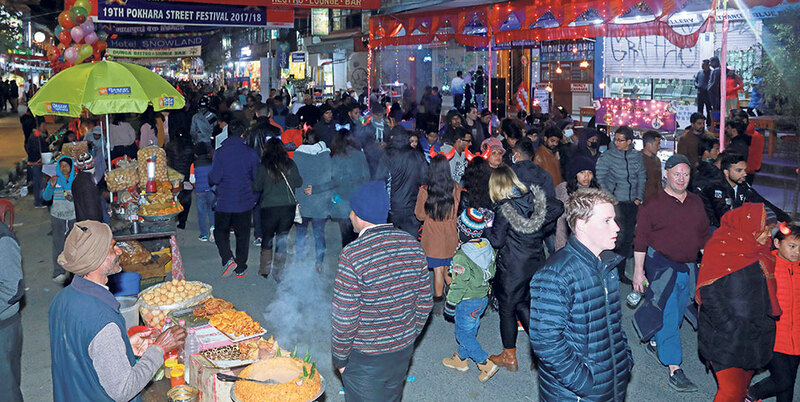 The street fest organized by Restaurant and Bar Association of Nepal (RBR) to bring in domestic tourist during this time of the year has been a huge hit.